SUBHEAD: We are just coming to grips with the fact that we can't turn the notion of money into real resources. 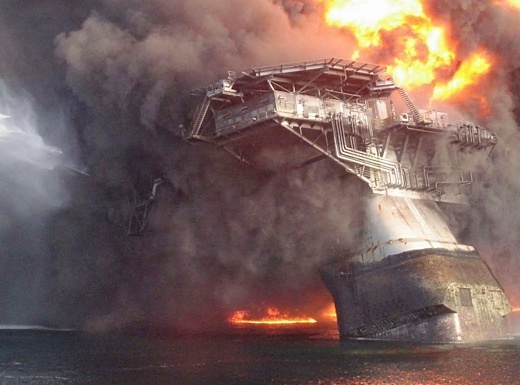 Image above: BP deep water oil well superstructure collapses into the Gulf of Mexico in 2010. From (http://www.planetinperil.ca/2014/09/british-petroleums-recklessness-caused.html). Peak Energy and Global Warming deniers have both been celebrating the Shale oil and gas industry drilling boom. Many are even claiming this signals an end to the West's dependence on OPEC and Russian fossil fuels. They clamor for the approval of the Keystone XL Shale Oil Pipeline pumping shale oil from Alberta to Texas refineries; and the construction of extremely expensive liquid natural gas (LING) facilities to export frozen shale gas. Back in 2013 was the first time I heard the hopeful term "Saudi America". It was coined to describe the golden future we were entering with a rejuvenated US energy sector. America would not only satisfy its own energy needs but become a major fossil fuel exporter. The "civilized world' of North America and Europe would no longer be energy dependent on its "enemies" in Russia and the Middle East. On its surface it will be much like the Housing Bubble in 2008 and will be similar to the DotCom Bubble in 2000. Pets.com was a former dot-com enterprise that sold pet supplies to retail customers. A high-profile marketing campaign gave it a widely recognized public presence, including an appearance in the 1999 Macy's Thanksgiving Day Parade and an advertisement in the 2000 Super Bowl. The banks were financing the startups and expensive Mergers and Acquisitions (M&A) thus getting astronomical profits. Perhaps the peak of the DotCom Bubble irrationality was the leveraged buyout in 2000 of giant Time-Warner Communications by the comparative midget AOL.com - (headed by Hawaii's own Steve Case connected to the family that ran Grove Farms here on Kauai). When the DotCom Bubble burst many who thought they had secured their future with a piece of the action, but found they had no more than "notional" wealth with nothing behind it but an URL. Remember the end of the Bush Administration in 2008? Investors were pouring billions of dollars into the development of suburban sprawl all over America. Housing prices were rising exponentially but borrowing was available to anybody with a pulse. Interest rates were high, but no matter. As long as housing values were going up you were safe and could borrow on home equity without limit. Banks were bundling the debt in mortgages into investment instruments for suckers. At times there were warnings. If that was a signal for anything it was a green light for banks not yet deemed too big to fail to continue constructing swindles called collateralized debt obligations (CDOs), which were bundles of already bundled mortgage backed securities based on junky mortgages for million-dollar houses owned by Las Vegas busboys, and the like, that had no prospect of ever being paid. We all know how that story ended. A hole in the ground so wide and so deep that it could not be filled with $20 trillion dollars (and counting). But fortunately for the banking crowd something else came up. Oil prices soared during the housing crisis peaking at almost $150 dollars a barrel in mid 2008. Well here we are at the End of the Obama Administration and another crash looms. This time its a shale fossil-fuel crash taking with it the strung out energy companies and the institutional and individual investors that bet on them. For the last several years, even though natural gas prices have been low, modern gas-well fracking allowed for the extraction of natural gas at a profit - as long as you could get the vast amount of water needed for nothing and did not have to worry about the cleanup of the toxic waste injected and ejected from the wells to get them to go. Oh, and you did not have to worry about the constant need for investment money to cover the leasing and equipment cost needed. Fracked wells did not last long and more had to be drilled to cover the cost of the last. Another Ponzi scheme. When the housing market crashed so did the price of oil. But that didn't last long. As oil prices steadily rose again, the business of extracting oil from shale stone began to make "economic sense". Yes, it was expensive and messy with many environmental risks - but it was oil. By 2011 oil was holding at about $100 dollars a barrel and there were a places between North Dakota and Texas where shale could be could be converted to oil with a large and continuous investment stream. The oil and gas boom in the United States was made possible by the extensive credit afforded to drillers. Not only had financing come from company shareholders and traditional banks, but hundreds of billions of dollars have also come from junk-bond investors looking for high returns. There have been few other ways to get a return on investment with the FED ZIRP (zero-interest-rate) policy needed to keep the Too-Big-To-Fail Banks on their feet. With zero interest paid on bonds and oil at $100 dollars a barrel we were transforming into Saudi America. But since July 2014 oil prices have fallen 40%. The Peak Energy and Global Warming deniers are reveling in the "good news". This shows they have been right all along and we are going to get a big bump in our economic growth as energy costs drop and consumers can now go out and spend again. But the facts are that economies around the world are shrinking, not growing. Demand for oil will follow suit. OPEC is not being cooperative in our plight. On Black Friday (11/28/14) OPEC announced it would keep pumping 30 million barrels a day. OPEC does not need Saudi America or Russia to have a larger share of the market and is perfectly happy to see shale oil be an unprofitable investment. All of the energy companies in the S&P 500 got their Earnings Per Share estimates decimated, even the biggest ones: Exxon Mobil by 20%, Chevron by 25%, Hess by 47%, Murphy Oil by 50%, and Marathon Oil by 63%. The banksters cannot finance our way out of this one. They have already shot their wad "saving" themselves. There are enough trillions of dollars of funny money that can buy a new life for corporate industrialism. And we can't keep shitting in our own nest. What is coming is an accelerating contraction of world-wide industrial economic activity that has been running on oil and on nuclear power. That's coming to an end. Fossil fuel power generation with its CO2 hangover are not viable either. Remember the destruction of the Gulf of Mexico by British Petroleum in 2010. It is becoming a choice between - on one hand food and water - and on the other hand transportation and industry. Nuclear power has been discredited by increasingly serious failures. The health/environmental disaster at Fukushima Daiichi Nuclear Power Station in 2011 (when three reactor cores escaped their containment) continues to expand imperiling not only Japan but the entire Pacific Ocean and beyond. Nuclear power is no option. I'll be looking for the food and water.